First shots can come in a wide variety of states--they can be fully painted or unpainted, have dates on their legs or lack them completely, be assembled or disassembled; in every case, however, collectors value most highly those pieces which are in some way different from their production counterparts, and which offer some form of insight into the production process behind the action figure line in general. 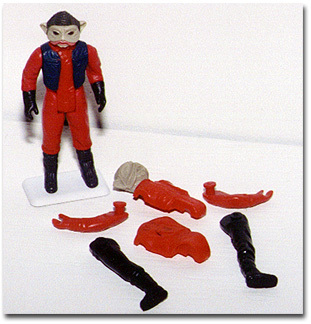 In the case of this rather interesting Nein Nunb first shot, the figure has not had the two halves of its torso bonded together through the common process of sonic-welding, a technique which uses high-frequency sound waves to melt and fuse the plastic of the torso into one piece. 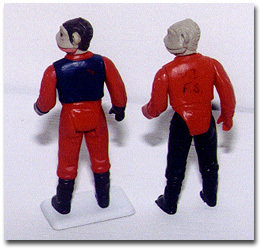 As a result, the figure can be taken apart.